Posted on March 26, 2014 by Tiffany F.
For the better part of a decade, I’ve done a fair bit of time traveling. Now before you jump to any conclusions and call me crazy, I don’t actually think I jumped into a time machine… It only comes with the territory of flying to Australia every year or two for the last eight years. Leaving Australia at 10am on a Saturday and arriving in Los Angeles as 6am on Saturday sounds kind of cool, doesn’t it? (Humor me.) Well let me tell you what isn’t quite as cool: crossing the international date line with a baby. Holy jet lag, Batman. I am tired! My now 6-month old has reverted back to the sleeping and eating habits of her 3-week old self, and I’m eating like I’m 30 weeks pregnant again. Must eat allll the food at 2 in the morning. 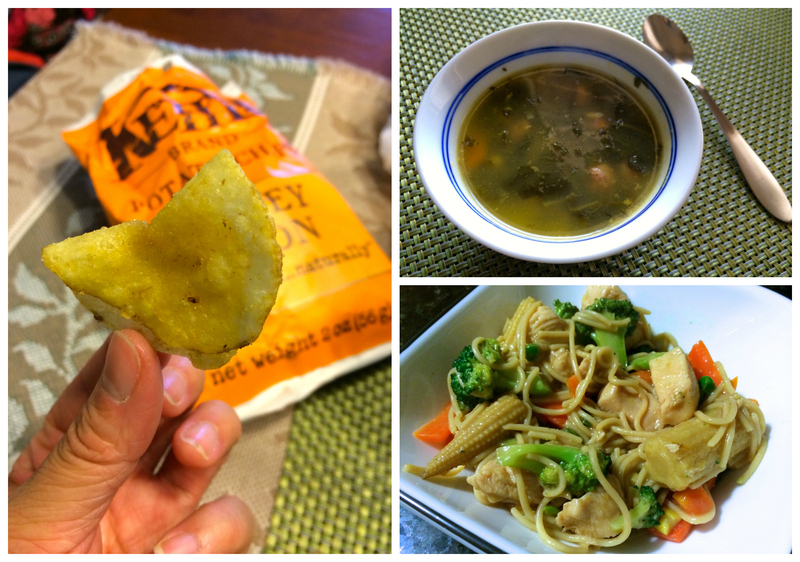 Speaking of food, let’s talk about what you came here for: my Monday eats! If you’re not quite sure what’s the deal with all these shenanigans, go take a stroll on over to Peas and Crayons to find out what this WIAW party is all about. 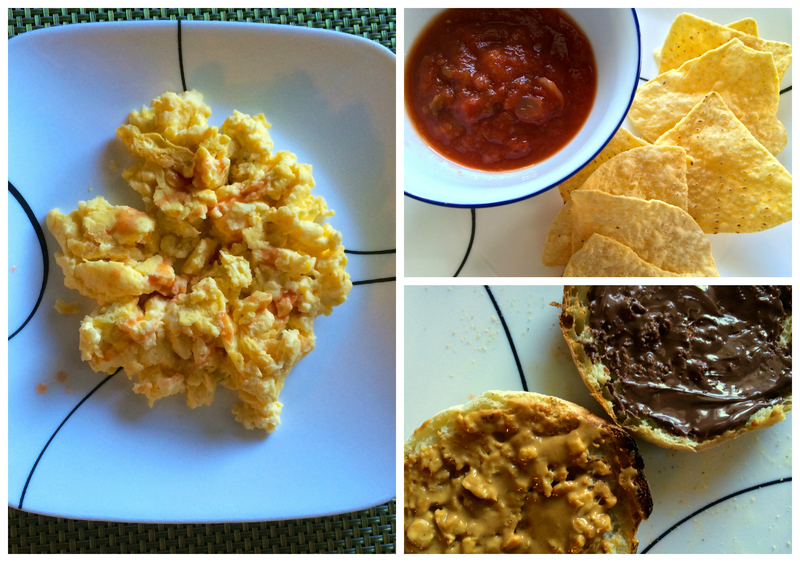 [Breakfast #1] The first meal of the day consisted of scrambled egg substitutes with mozzarella and hot sauce and an unpictured naner! [Snack #1] My morning snack was a handful of chips and a healthy serving of salsa. Not your typical morning snack, but I’m not ashamed! [Breakfast #2] Second breakfast was an english muffin with crunch peanut butter on one half and Nutella on the other. I haven’t had second breakfast since I was preggo but this silly jet lag has my body all sorts of confused! [Lunch] My mid-day meal was a can of Campbell’s Italian wedding soup. I was trying to limit my salt intake to get rid of some of this bloat from vacation, but we were running a little low on lunch foods so I had to make do with what I had! [Snack #2] My second snack of the day was a bag of honey dijon chips. My low salt intake goal for the day went straight out the window after that! [Dinner] My last meal of the day was a simple and easy chicken stir fry we whipped up using my homemade teriyaki sauce recipe. We washed that down with a Healthy Choice fudge bar after dinner! It feels so good to be back into relatively healthier eating habits. Sure I had a few slip ups this week, but who doesn’t make a mistake every now and again! On that note, my next meal of the day and a rolling baby awaits me off the internets! 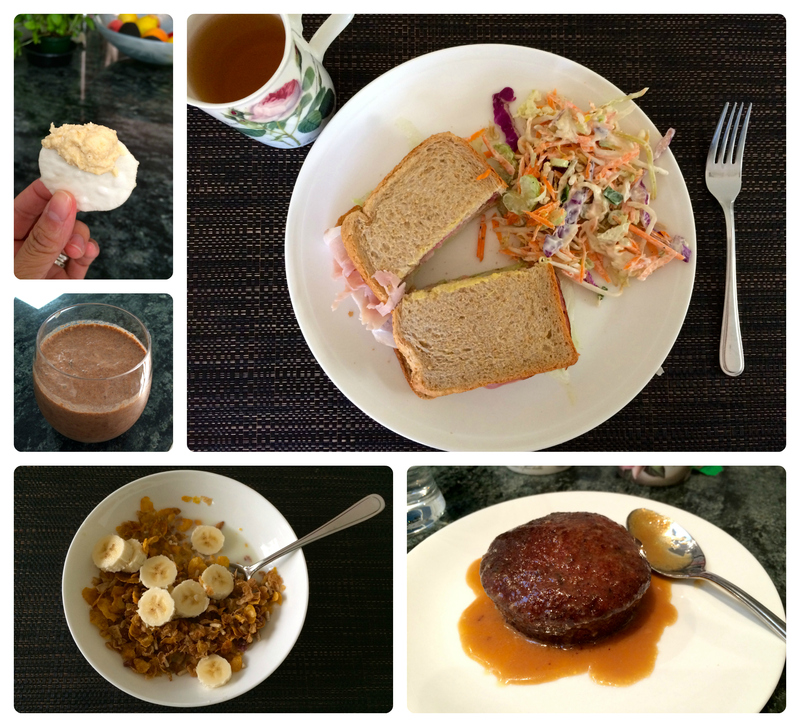 What was your favorite thing that you ate this week? Mine was definitely our last family dinner last Friday in Australia. It may have just been take-out, but it’s the company you keep that counts! 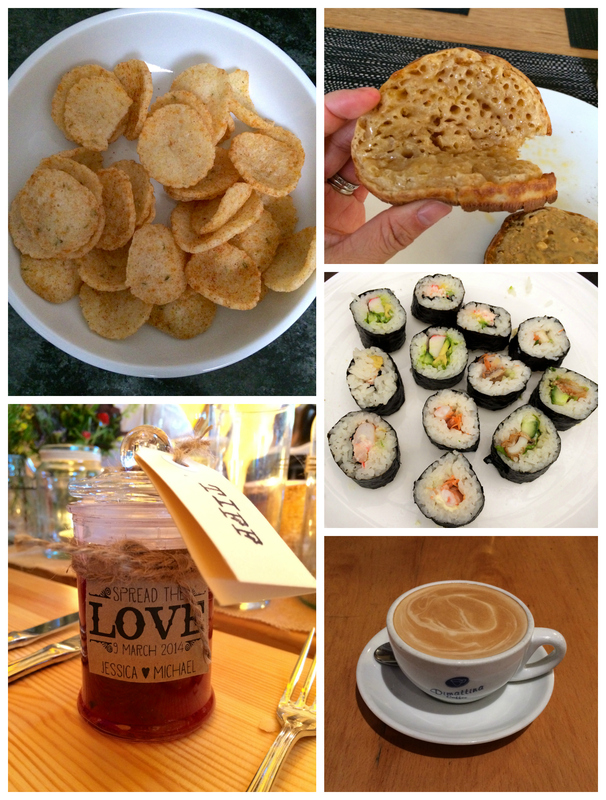 Posted on March 19, 2014 by Tiffany F.
We leave to head back to Boston on Saturday morning, so you better believe we’re making the most of our meals to make sure get in more of our favorites before we go. 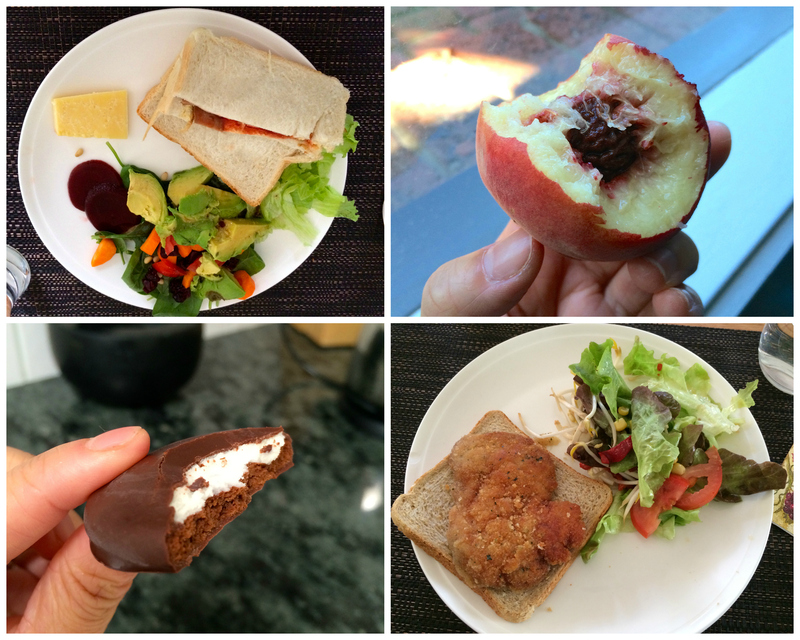 Here’s a little sampling of our eats this week! (1) I had a club sandwich with gherkin and chips for lunch while catching up with friends at the Melbourne Zoo. | (2) I’ve been drinking boatloads of herbal tea on the daily over the last couple of weeks. When in Rome… | (3) I also had my first beer in over a year since before being pregnant! | (4) Mini Oreo cheesecakes were on the menu for a family get over last weekend. They were just as delicious this time around. | (5) Rice crackers are all the rage over here, so I paired them with baby spinach, cashew, and parmesan dip a few times this week. I’m adding this dip to my list of foods to recreate at home! (6) More rice crackers for snacks but paired with plain hummus. Yummy! | (7) Rather than spend $5.50 at Gloria Jeans, we decided to recreate the infamous Tim Tam milkshake at home. Way cheaper and much healthier! | (8) I was on my own for lunch one day this week, so I had a ham & cheese sandwich with a side of coleslaw. | (9) Although I wasn’t a big fan of cereal in the past, I developed cravings for it while I was pregnant and they never went away in my postpartum days. | (10) I had my first taste of sticky date pudding and holy yum am I glad I tried it!! So tasty. Luckily baking isn’t my thing, so I can’t make this every weekend! (11) Nando’s is by far my favorite chain here in Australia, so of course I had to have my go-to Nando’s favorite: chicken tender wrap with a side salad and I also noshed on Rich’s side serve of chips with peri-peri salt. Nommmm! That’s all I have for you this week. This time next week, we’ll hopefully be back to our normal healthy eating habits. I wish I could say the same for our sleeping patterns! 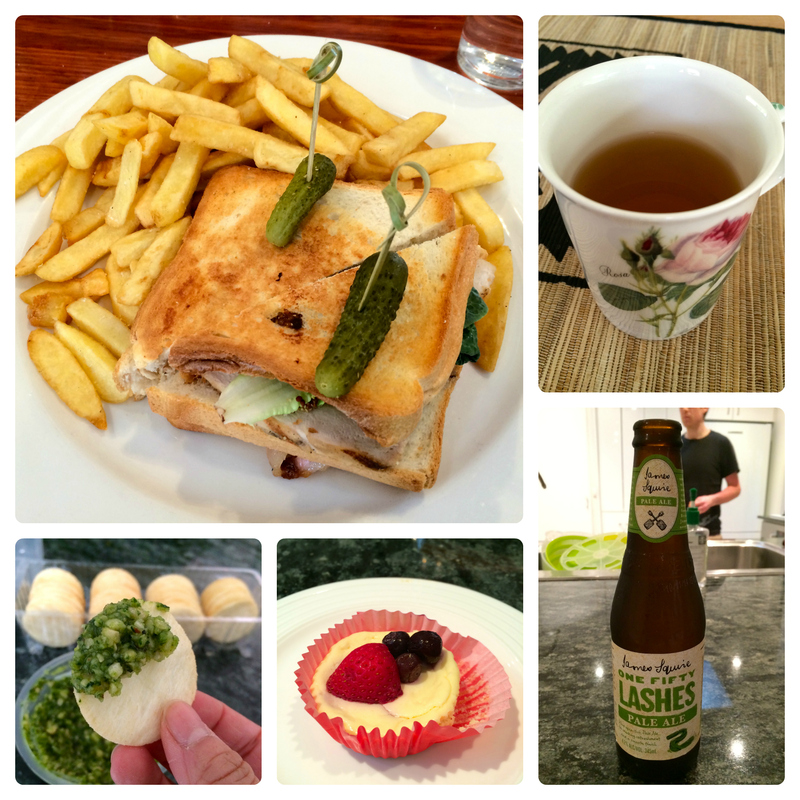 Posted on March 12, 2014 by Tiffany F.
Time to set things right with a little recap of what I’ve been eating during our first week Down Under! Although I normally wouldn’t indulge in food this much, it’s been over two years since our last visit so I’ve been going a bit overboard on tasting my favorites. I had seriously forgotten how ridiculously cheap it was to get sushi here compared to back in America. We bought eleven different hand rolls for $20 to feed four of us. Twenty freakin’ dollars for four full bellies! Unreal. It’s been fun enjoying the foods I’ve missed, but I’m definitely not looking forward to stepping on that scale again once I get home. For now, I’m going to continue to enjoy it because I know I’ll have to work hard to undo the damage once I get home. When you travel, do you tend to indulge in the foods you love and deal with the repercussions later or do you stay on point and enjoy a treat once in awhile?